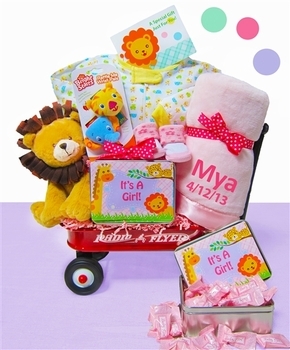 This cute jungle themed wagon set is the perfect gift for a baby girl. Featuring an heirloom quality baby blanket and much more, this unique assortment is certain to please both baby and parents. If desired, the blanket can be embroidered with name and birth date to create a timeless keepsake. Cute jungle themed plush toy makes this collection both visually appealing and practical.